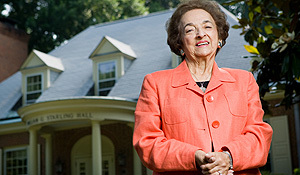 For many years, Alice Webster, as the unofficial goodwill ambassador of the Reynolda Campus, personified the Wake Forest spirit of friendliness and warmth. A worldly woman and gifted conversationalist, she took a personal interest in each guest, particularly the ones who might be future Deacons. In the Welcome Center, she was the source for information about campus tours and restaurants, but she also provided encouragement and reassurance to those on the verge of a very big decision. She died on Jan. 4 at the age of 85. Funeral services will be at 2 p.m. Sunday, Jan. 8, at First Baptist Church on Fifth Street in Winston-Salem.